Boink! "Ouch! Is there a wall there?" the little magicians wonder, rubbing their eyes in surprise. 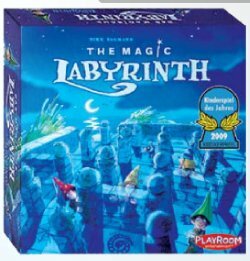 As they curiously explore The Magic Labyrinth looking for the lost symbols, they must avoid bumping into the invisible walls placed by the big magicians who love to play pranks. In this unique memory game, you can help the little magicians navigate through the secret maze using their magical magnetic pawns to discover the right pathway, while remembering where the invisible walls are located. If you forget your way, your magician must start back at the beginning. Can you conquer the labyrinth and be the first to collect 5 magic symbols?